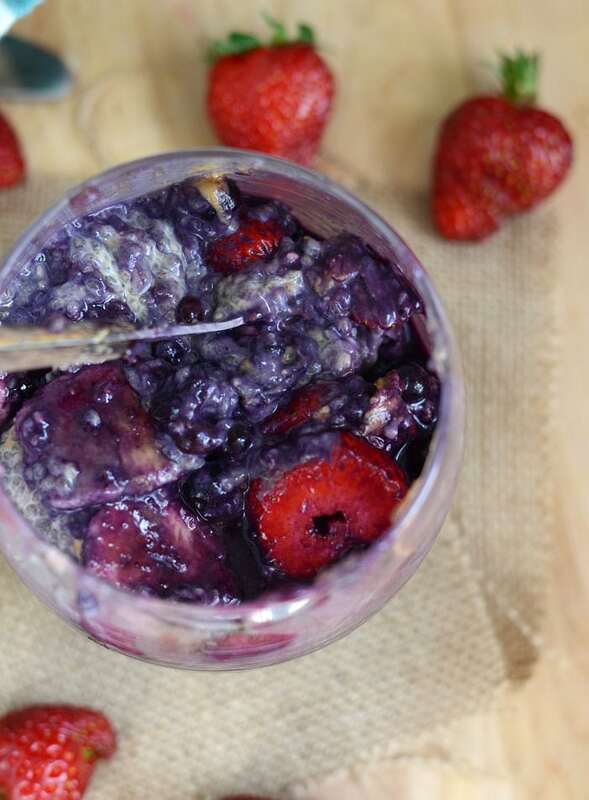 Peanut Butter Jelly Chia Seed Pudding - Healthy & Vegan! OMG. 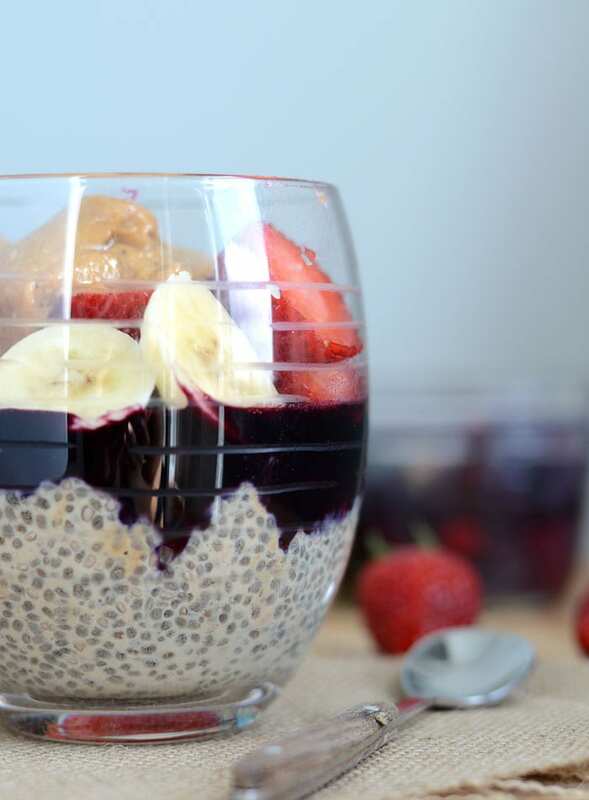 I’m totally obsessed with this Peanut Butter Jelly Chia Seed Pudding. I found myself actually saying “mmmm” over and over as I was eating it, it’s that good! Basically it’s like eating a peanut butter jelly sandwich that tastes like dessert, in chia seed pudding form. I will be eating this for breakfast for the foreseeable future. You know I love my chia seeds and even though I make chia seed pudding all the time, I don’t think I’ve shared enough chia seed recipes on the blog! Well, my friends, that’s about to change. I want you to love them as much as I do and reap the myriad of health benefits they provide, especially for us plant-based athletes. Chia seeds are a prime example of a superfood and chia seed pudding is a simple and delicous way to include them in your diet. 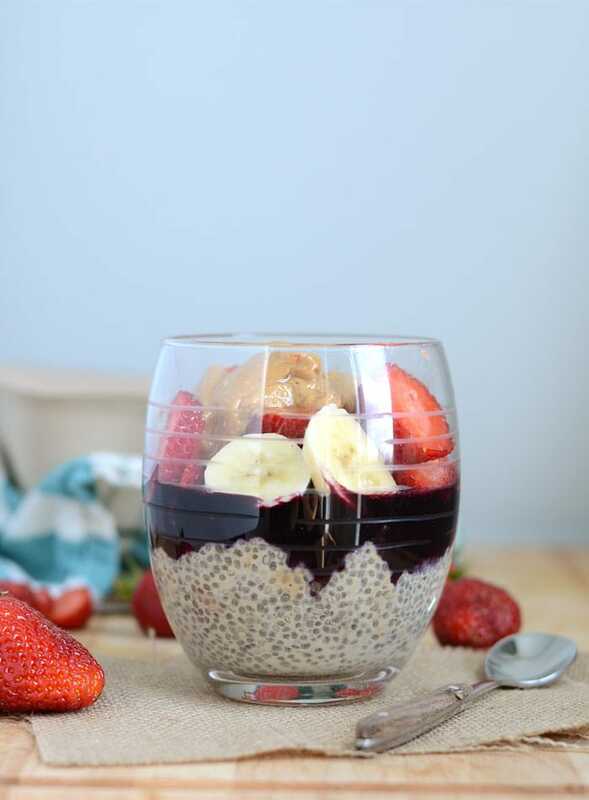 To make this yummy chia seed pudding, all you have to do is combine chia seeds, powered peanut butter and plant-based milk of choice in a container and place in the fridge overnight. In the morning, top with your favourite berries, more peanut butter and dig in! If you’re sad when it’s all over, don’t worry. Just make more. 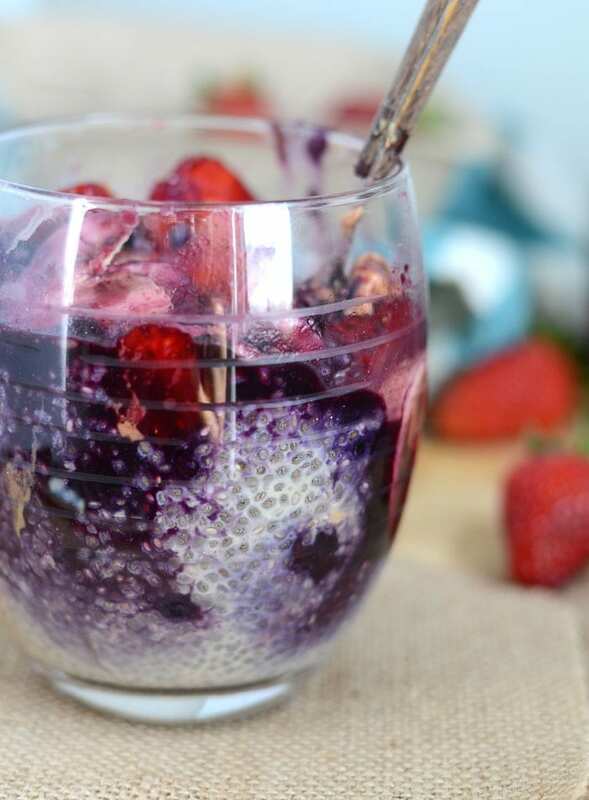 1/2 cup frozen berries – I used blueberries but any berries will work! Add the chia seeds, almond milk, powdered peanut butter and optional stevia to small container, shake vigorously and place in the fridge for 30 minutes, or up to overnight. In the morning, lightly heat the frozen berries in a small saucepan or in the microwave then add to your pudding. 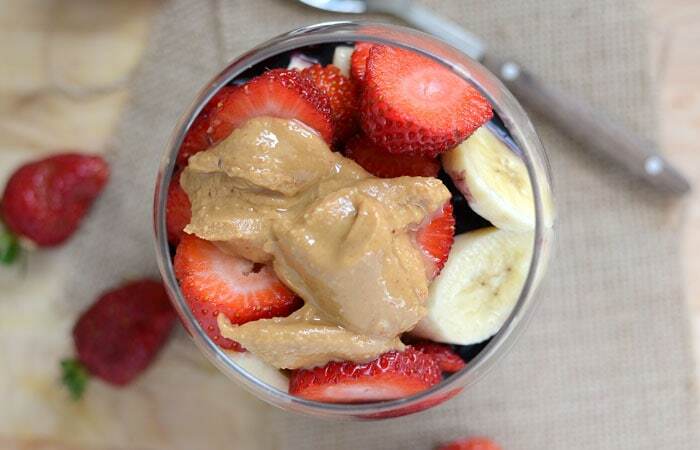 Top with sliced strawberries, banana and natural peanut butter. Whether or not you love chia seeds like me, you’ll definitely love these three energy bar recipes that feature the little power seed! Chocolate Chip Chia Seed Granola Bars – One of the most popular recipes on the blog! No-Bake Chocolate Chia Energy Bars – Also a classic. Chocolate, walnuts, dates and dark chocolate. SO GOOD! Chocolate Coconut Chia Seed Bars – Chocolate, coconut and chia seeds, together as they should be. Thanks as always for being here! Question: How do you incorporate chia seeds into your diet? I’d also love to connect with you on social media, especially on Instagram so I can see your recipe creations! Find me @runningonrealfood. AMEN for the classic flavor combo! I love chia seed pudding, and I’m 100% sure I would love this version! 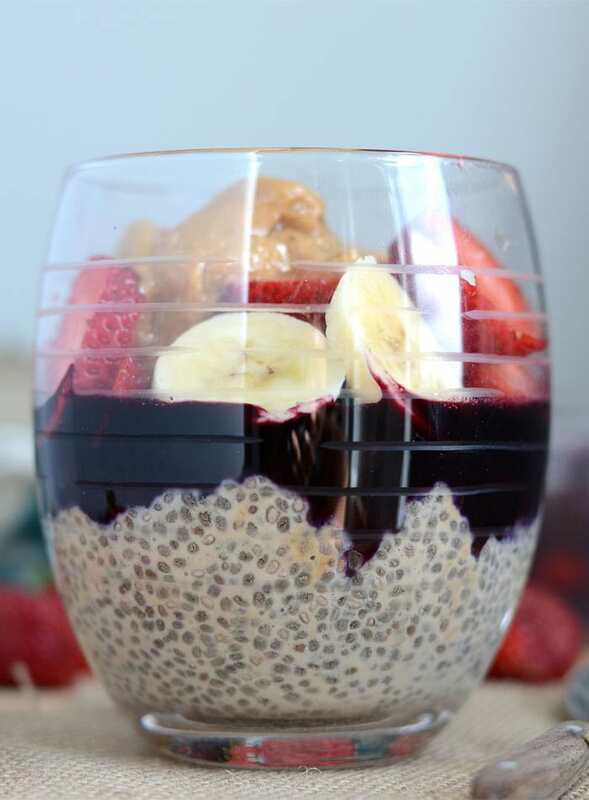 I absolutely love peanut butter and chia seeds so this is going to be my breakfast tomorrow! I love how this recipe is a healthy treat that can easily replace dessert while having so many health benefits! 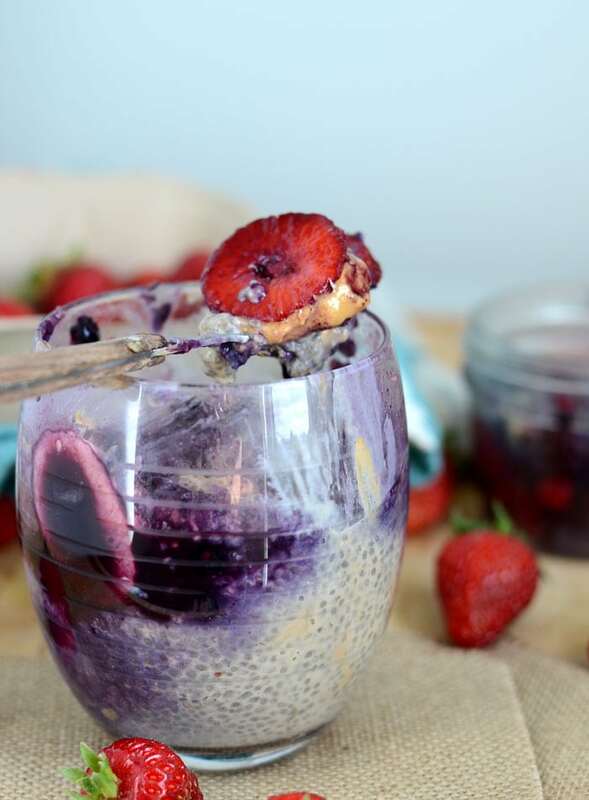 I really appreciate how you have highlighted the benefits of chia seeds as it being hydrating, high in protein, a good source in calcium, keeps you full longer, and stabilizes blood sugar. I was speaking to a friend who is a nutritionist and she claims that all seeds are the most optimal when it is grounded into a powder form, would you recommend this for chia seeds or is it perfectly fine to eat them whole? Stevia is also great alternative for sugar, although I haven’t been able to get past the after-taste that it leaves for me for the many years that I have been trying swap sugar for it! Would you recommend another natural sweetener for me? Hi Rachel, you can use maple syrup, agave, coconut sugar or nectar or date paste to sweeten this. I think chia seeds are ok to eat whole, since they absorb all the liquid it’s different from eating say a whole flax seed. I eat them both ground and whole…I’m not 100% sure on that though.